Their extraordinary collection was committed to the National Gallery of Art in Washington, D.C., and in 2008, in partnership with the National Gallery, the Vogels donated a portion of this collection—2500 works—to one museum in each of the fifty states. The Seattle Art Museum was selected by the Vogels to represent Washington state, and is now home to works by such internationally recognized artists as Tony Smith, Robert Mangold, Sol LeWitt, and Richard Tuttle. 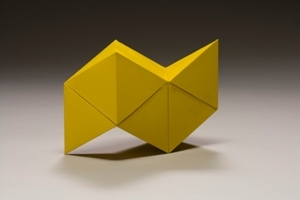 Yellow Bird, 1971, Tony Smith (American, 1912-1980), heavy-weight paper, adhesive, paint, 6 1/4 x 9 x 3 3/4in., The Dorothy and Herbert Vogel Collection: Fifty Works for Fifty States, a joint initiative of the Trustees of the Dorothy and Herbert Vogel Collection and the National Gallery of Art, with generous support from the National Endowment for the Arts and the Institute for Museum and Library Services, 2008.29.33, Photo: Courtesy National Gallery of Art, Washington, © Tony Smith Estate. Currently on view in the Modern and Contemporary Art galleries, third floor, SAM downtown.